As "Parallel," the first track on electronic musician Accelera Deck's Ipsissima Vox CD, begins, you hear what feels like gears shifting or synapses contemplating firing before the track rolls into a "groove" that's continually shifting and subverting your expectations. Somewhere between the ghost of a murdered dance track or the unfinished composition Philip Glass discarded as too weird, it (like the other 14 tracks), bears the mark of a creative wizard following his impulses to lead listeners onto unstable ground. Throughout Ipissima Vox static explodes, sounds bubble up and silence invades - it sounds like the work of someone cutting and splicing sounds, styles and mysteries in a way that's ever changing but still somehow holds together in a way that comfortably surrounds you. And indeed, Accelera Deck (Chris Jeely) is cutting and splicing here, taking 10 years of music he's created ("variously on cassette, 4-track and computer") and messing around with it. The result is edgy and exciting, filled with noise, space, and invention. Jamie Barnes is a singer-songwriter, but not an ordinary one. His songs find the balance between "pretty" and "raw" that similar musicians strive for but miss. The texture of Barnes' debut album The Fallen Acrobat is soft and lovely, built with acoustic guitar and piano. It offers that pastoral feeling that makes you imagine you're lying in a field somewhere, or perhaps walking alone in the woods. The lyrics, however, don't present some idyllic dreamland, but are filled with the complex emotions of real people. They're hopeful but acknowledge fears, mistakes, disasters. They're complicated, whether he's singing a love letter (the title track asks an intended lover to pick up his limbs before the vultures get them in case of an accident) or singing about the growth and decay that accompanies the passing of years ("Burning Leaves"). Barnes' music brings to mind folk-pop musicians of the past (Nick Drake emerges in some of the album's prettiest moments, like the dreamy "Ambition Is Poisonous") while sounding very of today and personal (in that way it often reminds me of James William Hindle's two albums)...but there's also an endearing do-it-yourself, kitchen-sink quality to the recording which truly amplifies the intimacy of the songs. The Fallen Acrobat is like listening to someone sing you his secrets, but in the friendliest of tones. The Bloomington, Indiana, band Brando (essentially Derek Richey's one-man show) trip through the universe with spacey rock that's got a thick, bluesy cloud hanging over it (fitting for a group once on a label called Smokeylung). Their latest album 943 Recluse manages to cut through that cloud and maintain it at the same time. The songs here are heady and dreamy like before, but they have a sonic clarity that's immediately gripping. That gives these songs an immediacy and intimacy missing from Brando's previous releases, even while the songs are as mysterious as ever, with lyrics that walk the line between meaning and confusion and a tendency to take off in unexpected directions. Sometimes, though, that direction is towards what's soft and lovely, as on "Abby Laine," which sounds like a prom night slow dance but is still as bizarre as they come. Sometimes it seems like Brando are single-handedly creating a new form of classic rock - combining blues rock, psychedelic rock and more straightforward power chords but then making them all sound alien. But here that isn't even the whole story, as pop melody isn't that far out of reach. There's something comforting about 943 Recluse's songs, but the more you get wrapped up in it the more it has the capacity to freak you out. Brando = Halloween (or Halloween) + UFOs + time machines + love letters + a pillow for you to dream upon. You could rewrite that equation til infinity and it wouldn't be quite right, but Brando would still be a great band. Under Achievers Please Try Harder is the Scottish group Camera Obscura's first album to be released in the United States, and it's a beauty. The group's basic sound is gentle, melodic folk-pop; to be explicit about it, every song reminds you of Belle and Sebastian at their most laidback and gorgeous. There's lovely strings, singer Tracyanne Campbell has an alluring voice, and the atmosphere of the whole affair just bowls you over with sweetness. The more you listen to the album, though, the more you'll realize that Camera Obscura's music is so much more than just pretty. Musically they inject their songs with a passion drawn more from American soul music than indie-pop. There's also smart allusions throughout to Motown, 1950s pop, Leonard Cohen, and old-fashioned American C&W; their sound has so much more to it than you first think. Lyrically the group's songs tackle human relationships in a way that's both witty and fierce. Some of the lyrics really cut to the core of things, giving insights into the messiness and hurt of relationships, even as the singer's hushed delivery at first makes you think she's whispering sweet-nothings. "Keep It Clean" opens with "Does it make you happy to ignore me on the streets?/I guess by now you think I'm weak," while "A Sister's Social Agony" includes the almost shocking line "I want you to know I thought about you last night/I cried" (sung in a light doo-wop tone)…lyrics that are edgy and heartbreaking where you expect them to be coy and innocuous. All in all Camera Obscura have a grip on the history of pop music, an ability to craft songs that are sweet and sharp, and a keen sense for how people relate to each other for good or bad…all are qualities that make Under Achievers an album you'll want to keep within reaching distance for a long time to come. 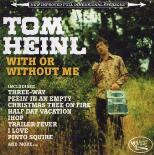 Tom Heinl's With Or Without Me album has the basic style and sound of true country music down pat (think Merle Haggard, not whoever's topping the charts these days). Slip one of Heinl's songs into the jukebox at a country dive bar and the patrons would hardly notice it; it'd fit right in. But if you're looking for songwriting anywhere near the quality of those country legends, you're in the wrong place, to say the least. At first glance Heinl might be a new George Jones, but beneath the surface he's more like a new version of the Country Bears Jamboree. This is imitation for the purpose of satire; Heinl puts on the country costume and sings about his trailer home, his car, his alchohol, etc. in a ridiculous way that's meant to be funny but almost sound serious. His sense of humor might win you to his side, but if you don't find his songs funny (and I really don't), you'll find this to be a pretty hollow experience. The melodies are routine, the lyrics unfunny and lacking anything genuine. The cover of Tom T Hall's "I Love" sticks out like a sore thumb; next to it Heinl's songs are almost invisible. Think indie rock and a sense of humor are antithetical? Or that musicians who are funny can't also write songs filled with genuine emotion? 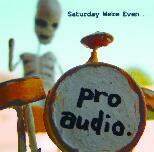 You need to hear Pro Audio's album Saturday We're Even…, which is packed with irresistible pop-rock songs that are fun but not frivolous. Pro Audio's songs have punchy keyboards, catchy melodies and harmonies (sung in a low-key, casual way), and rock n' roll drums as a base, and occasionally dress them up with the help of friends (horns, banjos, violin, and 8 backing vocalists). That collaborative slant, an overall loose and friendly vibe, and the DIY, non-pop star approach evoke the spirit of the Elephant 6 collective in spirit and slightly in sound, while in other places Pro Audio recalls a less nonsense-laden Pavement or a more eclectic Weezer. In any case, no matter who you compare them to, what's clear is that Pro Audio have the means to win over your heart while making you chuckle and sing along. There's really nothing better in the world than coming across a band you've never heard of (a self-released, quite homemade-looking CD, no less) and being completely taken with them. According to their web site, Pro Audio (who are based in Los Angeles) are more or less on hiatus. Check out their album and convince them not to break up - their music will make you so much happier than that of your average critic's darling or Next Big Thing. Bands you love covering the songs of a band you love equals a unique pleasure that's hard to describe. That's the case I find myself in with Matinee Recordings' Romantic and Square Is Hip and Aware album, with the stable of Matinee artists (Simpatico, Lovejoy, The Would-Be-Goods, Pipas and 8 others) playing the songs of The Smiths. 2004 is the perfect time to pay tribute to The Smiths, not just because they were a great and influential band which doesn't get enough tributes like this, but because Morrissey + co.'s brand of nervous nonconformity was undoubtedly shaped by the political climate of the Thatcher years…and the recent conservative retrenchment in the US, UK and elsewhere echoes that period in a way that gives these songs an added importance. The way Morrissey's self-deprecating view of love is tied to the Cold War climate of fear and paranoia is clear right from the first track on Romantic and Square, The Pines doing "Ask," with its indelible line "If it's not love than it's the bomb that'll bring us together." That sentiment rings through powerfully, but so do Pam Berry's lovely singing of it and Joe Brooker's overlapping guitars, which are truly stunning in how lovely and melancholy they sound. The Pines and all of the rest of the bands here take a loving approach to the material; it shows in the way they highlight what was great about the originals and in how handily they showcase their own styles and aptitudes without overshadowing The Smiths. The collection is filled with magic moments: The Lucksmiths stripping the immortal "There Is a Light That Never Goes Out" to its essence; Slipslide casting a soft, lovely sheen on "Please Please Please Let Me Get What I Want"; Simpatico's Jason Sweeney doing a brilliant Morrissey vocal impersonation on "That Joke Isn't Funny Anymore" while still sounding like himself and keeping the song as heartwrenching as ever. Romantic and Square Is Hip and Aware is one of those rare tribute albums that makes you remember how much you love the original musicians and makes you love the interpreters even more at the same time. Wish for a World Without Hurt, an instrumental collaboration between Mark Beazley (Rothko) and JS Adams (Blk w/Bear), has near its beginning the crashing sound of something breaking free and falling, like snow for an avalanche or, in this case, buildings. Wish was created "in remembrance of the events of 11 Sept 2001"; in that context, the opening crash sounds are terrifying but the forlorn piano passage which follows it is both sad comforting. The entirety of Wish for a World is like that, filled with hurt and pain and despair but also hope, beauty, joy. As such it feels more like a work of healing than just a remembrance. Adams (www.artbear.com, the sound and visual artist of the pair, offers a ghostly radio dial filled with smothered news reports, buried transportation and fuzz/feedback from the great beyond. Beazley (www.rothkomusic.com) is the ambient impressionist, offering silent melodies and clouds of atmosphere. Together they've crafted a work that's delicate and eerie, which presents their musical dialogue about the aftereffects of the attack in an open-ended yet potent way. Generally speaking, there's two reasons to make a tribute album: to celebrate or to re-interpret. The best covers make you realize the greatness of music you dismissed or weren't aware of, or cast a new shadow on familiar music, making you think about it in a different way. Spiders From Venus: Indie Women Artists and Female-Fronted Bands Cover David Bowie does neither. The title makes you expect an example of the latter; the "venus" reference suggests women are likely to interpret Bowie differently from men. But instead of insightful, the majority of the 19 songs are the epitome of "alternative rock" blandness, with generic guitars and even more generic vocalists. Even worse, the groups take on Bowie either by trying to sound just like the original (and failing in most cases, except for a couple decent straightforward covers, by Essra Mohawk and Tegan & Sara), or more often by taking his songs and just straight-up messing them up. The most obvious example is "Changes" by Joe K's Kid - they mess with the timing and phrasing of the chorus in a way that has to be heard to be believed. It makes me wonder if they know anything about David Bowie whatsoever, it's that ridiculous of a change. In fact the biggest problem with this tribute is just that, it's hard to understand why these musicians are covering David Bowie at all. But enough of the negative; somewhere in the middle of this sea of awfulness lies one truly worthwhile song. Astrid Young strips Bowie's glossy "Modern Love" down to its emotional essence in a beautiful country-folk take on the song. It's moving and lovely, the sort of interpretation you want to hear. It's a shame it's buried as track 14 on such a tiring collection. Songs where musicians express dismay at the actions of world leaders ("political songs") work best when: 1. They come across as heartfelt personal reactions delivered out of genuine hope that the world could be a better place, not expressions of an agenda. 2. They work as songs even outside of the lyrical content - i.e. they're songs, not speeches set to music. 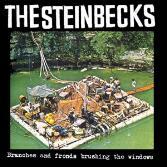 The Australian band The Steinbecks' "Guilty Spring," the first track on their Branches and Fronds Brushing the Windows EP, is exactly the right kind of protest song, one that gets at universal sentiment currently lurking in the hearts of so many of us (namely, guilt at living in a country that started or is supporting an absolutely senseless war) and is also a smashing pop-rock song, building and releasing tension in a splendid way. Don't let conventional wisdom convince you that political songs are always about advancing an agenda or converting people to your side; most often they're simply a person or group of people saying "what I see isn't right," pointing to an injustice instead of looking away. Branches and Fronds' second track, "Arafura Sea," is in the same mold: a non-didactic, melodic and melancholy song about West Papua's struggle for independence from Indonesia. Other songs are more hopeful or less global ("Mens Suit Hire" describes a Don Juan type, for example), but win through melding bouncy pop melodies with rock and roll crunch, in a way somewhat reminiscent of the direction Superchunk's been heading in recent years. The Steinbecks have been around a while (check out the lengthy band history on Microindie's web site), but this is the first full recording I've heard of theirs. It will not be the last, that is for sure.